Summer at the Shore is a fabulous thing; seemingly endless hours of delightful sunshine, wonderful ice-cream, a spectacular sunset over the concrete ship, then a beer and a slap-up meal in town. And so many things to do during the day - but is it time to reflect on the hows, whens, wheres and whys of what we do at the beach? Cape May is busy, very busy right now - both with fun-loving tourists (and us locals!) and with transitory migrant birds and parties of post-breeding birds with young still to feed. It would be nice to think that we could all get along, all find time to care about each other. And yet I find it a sobering thought that, of the 49 miles of open, sandy beachfront in Cape May County, just 1.7miles is strictly off limits to people - and half of that simply because it is the coastguard unit. I don't know about you, but I always thought that sharing meant doing things fairly. This wonderful set of pictures was sent to me by photographer Beth Polvino a while ago and I didn't get time to get them posted until now. Looking at them reminded how wonderful the beach can be for both people and birds if we just get the balance right. 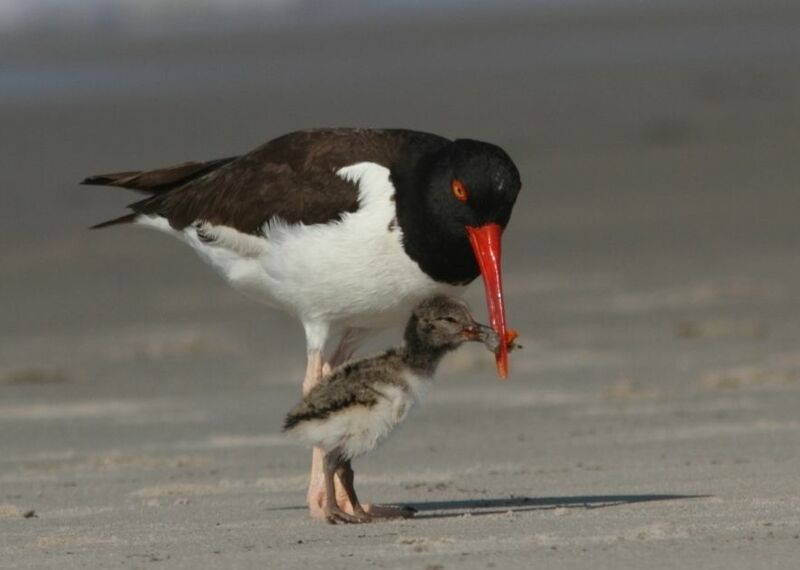 Of three pairs of American Oystercatchers that attempted to nest on South Cape May Beach this year, just one chick survived to fledging. Time for a reprieve for our wildlife? Kite surfers at Two Mile Beach just south of Wildwood Crest recently. People are surely entitled to have their fun, but should we turn every single piece of beach over to our leisure activities, or should some beaches be left in peace? [Photo by Mike Crewe]. Powered hang glider approaching Cape May Point State Park. 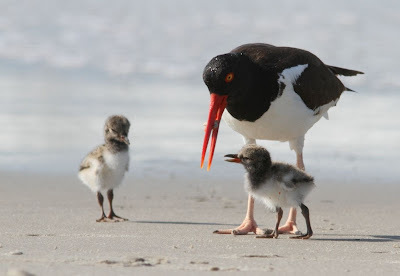 The South Cape May Beach is designated a wildlife beach for endangered migratory bird species - should we not ensure that everyone knows that and respects that? A single hang glider may not be too big an issue, but disturbance in all its various forms can seem almost relentless some days [photo by Mike Crewe]. Good birding continued at The Meadows yesterday with a Stilt Sandpiper turning up in the wonderful gathering of birds there. Our regular Friday evening walk at The Meadows also produced a couple of Willets along with most of the species mentioned yesterday. The mud continues to attract plenty of birds, as does the beach there, which recently has had a small gathering of Black Skimmers, a single Lesser Black-backed Gull and a continuing couple of pairs of American Oystercatchers. 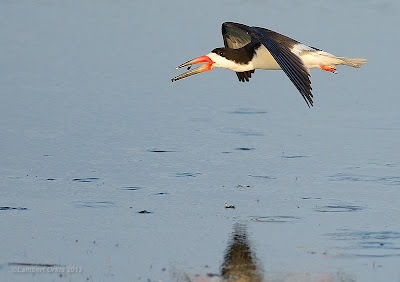 Black Skimmers are always a delight to watch and an evening walk at The Nature Conservancy's South Cape May Meadows is usually a good spot to be to catch this unique feeding behavior [photos by Lambert Orkis]. Mention should be made of the remarkable flight of Swamp Darner dragonflies that took place last Wednesday evening. Unfortunately I was elsewhere and missed this spectacle, but a number of people have told me of the thousands of large, dark dragonflies that swarmed through Cape May Point a few evenings ago and it really seems to have been a spectacle that you just couldn't miss if you were in Cape May that evening. Swamp Darners do breed around Cape May and can be found throughout the summer, but we also regularly get incursions of these insects from further south. These are individuals from southern populations that push northward when breeding ponds start to dry up as temperatures soar. We often see a return migration during September too. A stronger whiff of fall is creeping into Cape May as the first songbird migrants begin to roam further afield. 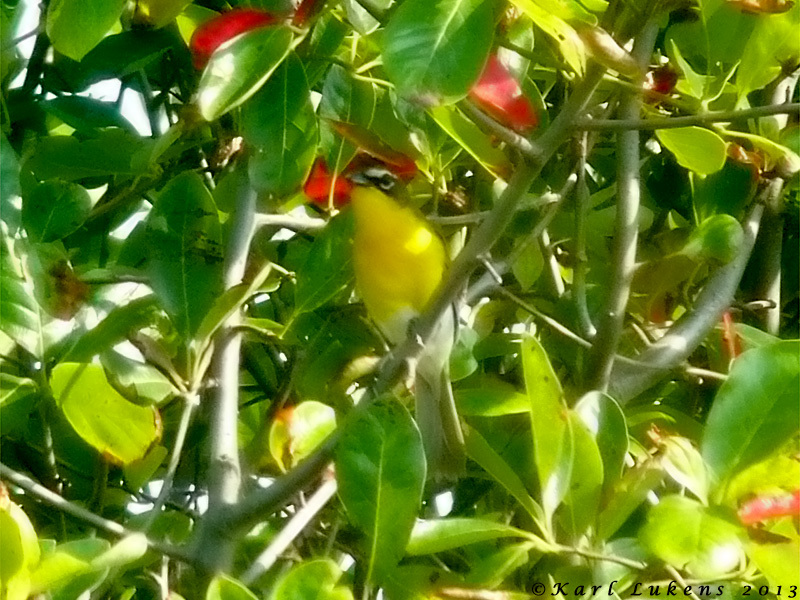 The appearance of juvenile Yellow Warblers on our walk last Wednesday, plus a couple in the garden of the Northwood Center today, most likely involved local birds, but a Palm Warbler at the point today was certainly not expected. Small gatherings of Tree and Barn Swallows are building up here and there and a very vocal Solitary Sandpiper passed over our house at 06:30AM this morning... Plenty more to come! My top tip for birding Cape May this weekend is to plan a visit to The Nature Conservancy's South Cape May Meadows. A combination of recent weather events, management strategies and a modicum of luck have come together to provide perfect shorebird habitat, right at the time that migranting shorebirds need it most. I took a walk at the meadows on Wednesday evening and found a spectacular array of birds to enjoy. The range of species is low at the moment, but will likely increase as the season moves on. Several hundred Least Sandpipers dominated the scene, with smaller numbers of Semipalmated Sandpipers, Semipalmated Plovers, Spotted Sandpipers, Short-billed Dowitchers and Greater and Lesser Yellowlegs, as well as three Pectoral Sandpipers. Snowy and Great Egrets, Glossy Ibis and a mass of loafing Common and Forster's Terns completed the scene. I spoke to reserve manager Adrianna Zeto-Livingston and she told me that the water on the meadows is being drawn down early to try and dry sections out for the winter period, when a certain amount of vegetation management will take place to help prevent the shallow pools from completely disappearing into acres of cattail marsh. Management strategies such as this are necessary to maintain optimum habitat for a wide range of species and the work of The Nature Conservancy at this site is certainly paying off. 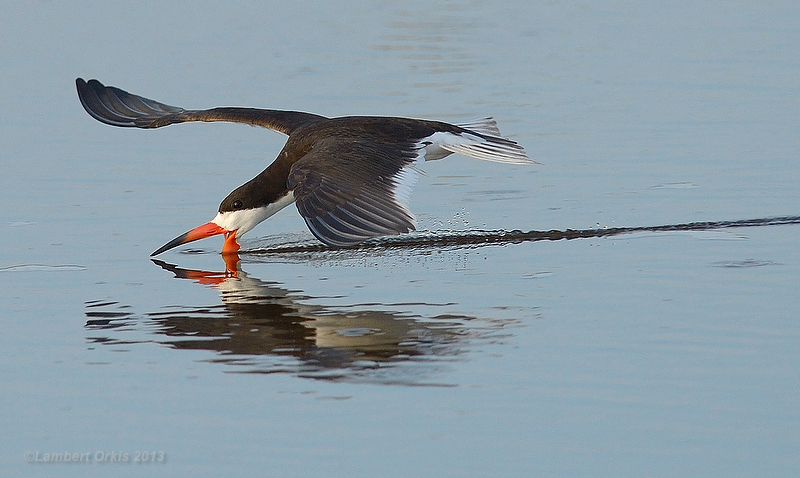 Head on down to the meadows this weekend and see what else is lurking among the shorebird throng! Though luck certainly plays a major part in getting good bird shots, putting yourself in the right place and waiting quietly also plays a part. A quiet spot and a little patience had me ideally located to get up close and personal with feeding shorebirds, like this Least Sandpiper. This early in the season, most shorebirds that you see will be adults like this one, identifiable as such by the rather dark overall appearance to the upperparts [photo by Mike Crewe]. 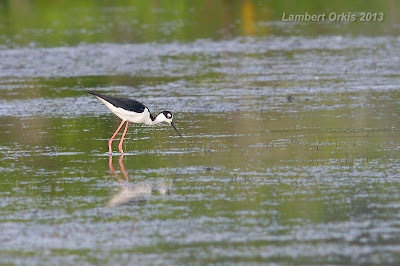 "Visiting relatives a little north of here, I was inspired by your recent lovely blogs to pass through Cape May on the way, and this evening while walking The Meadows, I met Karl Lukens who was looking for the Black-necked Stilt which I had just seen a little before and photographed. Karl asked where it was and before I could answer, he just found it himself. I wish I had his eyes!" "Anyhow, we had a great chat and while talking, a lovely Black Skimmer flew by". "And earlier, on the beach, it seems that the American Oystercatchers are getting ready for another try at having some youngins!!" "Cape May has been great for us in the Fall, Spring, and also in the Winter. Now, I'll add Summer to great times to go." We can't agree more Lambert! Summer may well be a little slow compared with the heady days of spring and fall migration, but there really is never a dull day at Cape May. Come and take your camera for a walk and leave the crowds behind for a couple of hours! With temperatures continuing high for a while, it looks like it's going to be a great time to get out on the water, and judging by the number of people I have seen doing just that of late, it is clear that Cape May's backbays are the place to be right now. With water levels higher than usual at ponds south of the Cape May Canal, shorebirds can be hard to pin down at the moment as there just isn't that much marginal habitat for them to feed in. So the answer is to get out on a boat and get ready access to the intertidal areas, for here you will always find some mud while the tide is out, regardless of any rain. From July onward, the backbays bristle with activity as the young of local breeding birds such as Clapper Rails and both Yellow-crowned and Black-crowned Night Herons get out into the channels, Ospreys ferry food to their ever-growing youngsters and the southward migration of shorebirds really starts to get underway. Right now, Least Sandpipers and Short-billed Dowitchers are dominating the shorebird flocks, with many more species to follow as the season progresses. Locally breeding Eastern Willets will be around for a few more weeks yet but, once July is out, they will certainly become harder to come across and will gradually be replaced by migrant Western Willets which pace through here on their way south. One thing is for sure, a July boat trip will get you some great up-close birding opportunities and might, just might, turn you up something really special. Just a few days ago, I received an email from Charlie Steiger of Wildwood Crest. 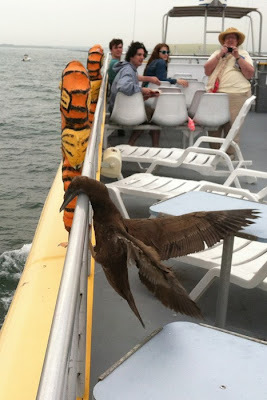 Charlie had been out on his boat and photographed a bird that he wanted confirmation on - and Charlie's guess was right - a juvenile Brown Booby had landed right on his boat, right off Cold Spring Inlet!! Check out our online calendar or Kestrel Express, or pick up a printed Kestrel Express from our store off Lighthouse Avenue and see what boat trips we have coming up. Most trips offer loaner binoculars and/or the assistance of local naturalists to help you get the best from your trip. Oh and don't forget your camera. Oh, and don't forget to share with us what you saw! It is very appropriate that Bob Lubberman, Captain of The Osprey and organizer of some fabulous backbay boat trips for us, took this great photo of an Osprey family in Cape May Harbor recently. Osprey chicks are getting pretty big now and can easily be told from the adults by the pale tips to their brown upperparts, giving them a very speckled look when compared to the plain brown adults. Boat trips such as these offer wonderful opportunities to get up close and personal with these birds as they get used to passing boats. The intertidal backbays and creeks always have feeding opportunities for wading birds when the tide is not at high water, even when freshwater ponds are full after recent rains. 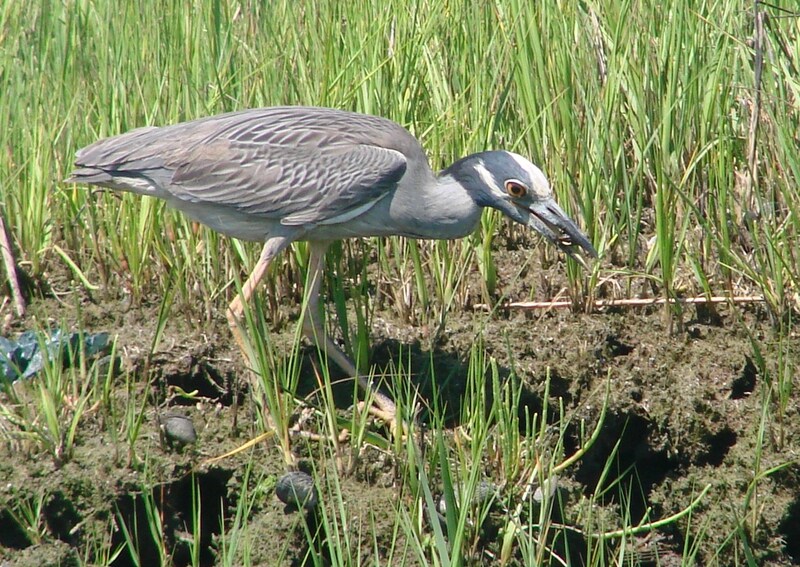 Many of these areas are almost impossible to get to on foot, so a boat trip really is the best way to get in amongst the birds - like this adult Yellow-crowned Night Heron, photographed recently from The Osprey [photo by Bob Lubberman]. On July 11th, Charlie Steiger was running a short fishing trip off Cold Spring Inlet when this all-brown bird came flying right around the boat. 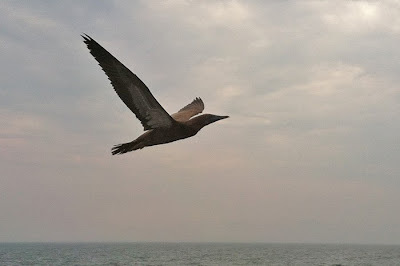 As Charlie surmised, the bird is a Brown Booby - perhaps the one that had previously been reported from further north along the New Jersey shore [photo by Charlie Steiger]. 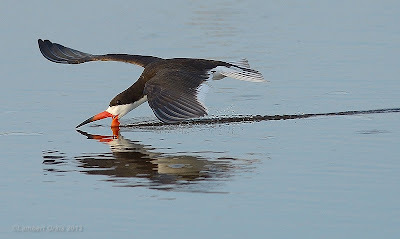 Most good sightings recently have been of waterbirds, reflecting the fact that migrant shorebirds and other waders really are the birds to be focusing on right now. A Stilt Sandpiper was at Heislerville on 21st (incidentally, I hear that Heislerville impoundments are to have the water kept drawn down through Fall this year, so it certainly will be worthwhile checking them on a regular basis), two Snow Geese and an American Bittern were reported from Brigantine on 19th and two Ruff and an American Golden Plover were at the latter site on 21st. 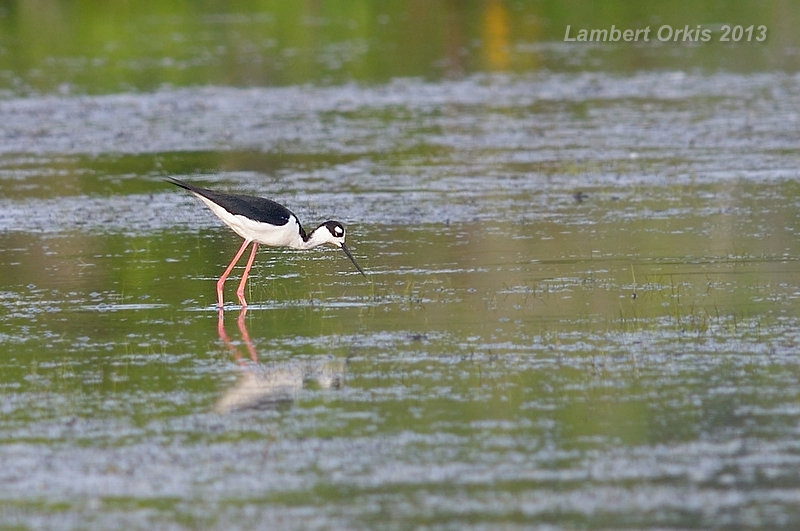 A fly-by Black-necked Stilt graced our Meadows walk this morning - albeit briefly - and a White-winged Scoter was on the sea off the Cape May beachfront today. An interesting mix of early migrating birds and late breeding individuals is filling our regular weekly walks at the moment. On the one hand, House Wrens continue to start new nests in local boxes, on the other hand, many of our walks are now being highlighted by small parties of Short-billed Dowitchers, Least Sandpipers and Glossy Ibises passing overhead. 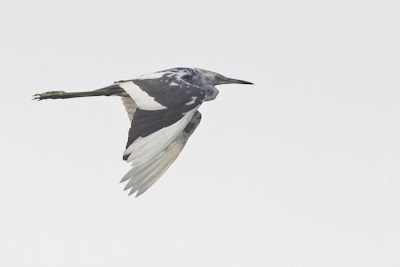 A recent evening walk at Avalon gave some great views of local Black-crowned Night Herons flying out from their daytime roost to feed, while the beach is starting to fill with Semipalmated Sandpipers and Semipalmated Plovers. 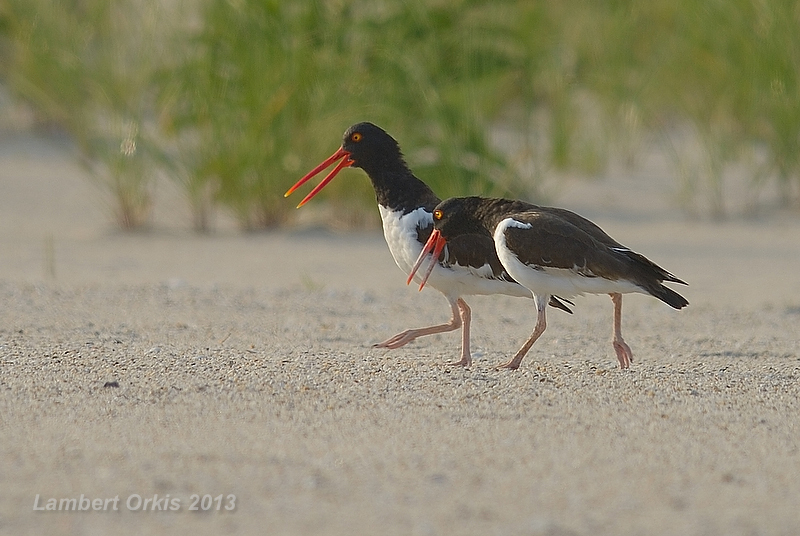 A good tip if you are visiting Cape May at this time of year is to visit the barrier island beaches after 5:30PM - you will be surprised how the people melt away and hungry migrant birds finally get a chance to find somewhere to feed. Over the past week, small numbers of Brown Pelicans have been making their way north, most reliably being seen from either Cape May Point or Stone Harbor; tern numbers are steadily building up at the point too, with occasional reports of Sandwich and Roseate Terns - though these last two species have been very elusive and mostly move on quickly when disturbed by beach walkers. My first white juvenile Little Blue Heron of the season put in an appearance on our Wednesday walk this week and was a little more expected than the wacky, half-white-half blue, second-year bird that showed up last Friday (12th). Stone Harbor Point is always worth a visit or two at this time of year and Tom Reed turned up two Brant and a Roseate Tern there on July 15th, while a little further away, Brigantine continues to attract good shorebird numbers and recent (unchecked) reports have included Brant, two Marbled Godwits, White-rumped Sandpiper, Wilson's Phalarope and Roseate Tern. Temperatures approaching 90F have been a feature of the past week around Cape May and a southerly airflow has seen an impressive influx of migrant dragonflies, mostly involving Great Blue Skimmers and Swamp Darners. Many other species continue in good number too, and reports of Comet Darners from Cox Hall Creek probably also involve migrants. Butterflies remain a little on the lean side this year - though I still haven't heard results of the Cape May County Butterfly Count yet. Despite what appears to be a quiet year for many species, there has certainly been a noticeable increase in the last few days with Broad-winged Skippers now much in evidence at Sweet Pepperbush flowers and the coming week or two should see some great butterflying - I notched up my first Monarch of the year last Monday in Cape May Court House, a slightly tatty Juniper Hairstreak on Wednesday at Higbee Beach and a Hackberry Emperor at the Northwood Center today. The weather looks interesting for the coming week; though continuing hot, localized rain showers could bring in good numbers of passing migrants. It's always a good move to get out as soon as possible after a rain shower and check what is riding out the weather. Some of our local breeding species continue to put on a good show right now; Yellow-breasted Chats are still singing at a variety of open locations around Cape May Point and often seem to show better midsummer than they do when they first arrive [photo by Karl Lukens]. Keep an eye on the weather and visit Cape May wetlands after the passing of a good shower. 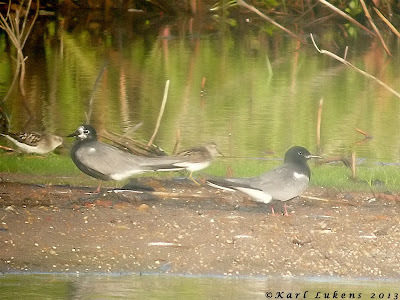 Last week saw the sudden arrival of three adult Black Terns, nine Spotted Sandpipers and some 50 Least Sandpipers at the South Cape May Meadows after a particularly heavy shower [photo by Karl Lukens]. Late summer and early autumn is a good time to look for juvenile Black Terns at Cape May Point, but it is far less usual to see smart adults in full breeding dress here. 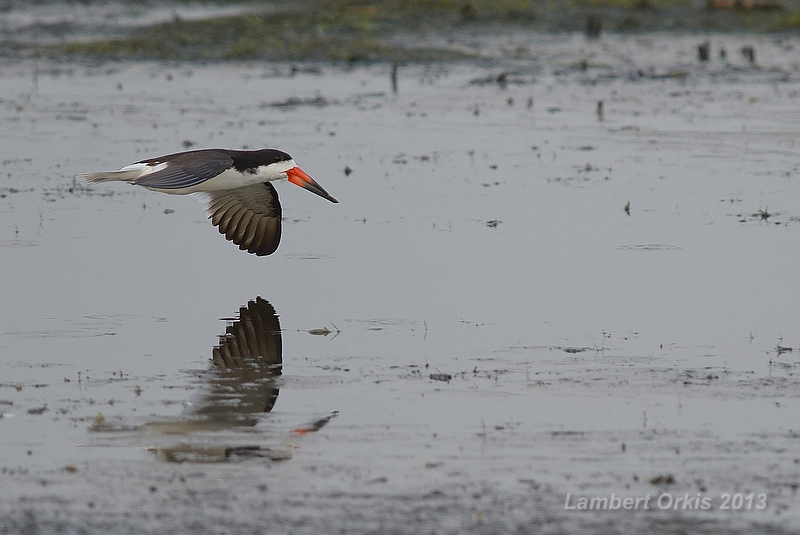 This bird was one of three at the South Cape May Meadows on 11th [photo by Tom Reed]. Time and again we get great reports of the wonderful birding to be had on a CMBO boat trip around Cape May's back bays. We have plenty of trips to choose from, either around Cape May itself, or up at Somer's Point on the Great Egg River. This adult Yellow-crowned Night Heron was a popular highlight on one of our recent trips [photo by Warren Cairo]. Keep an eye out on the backbays and waterways behind the barrier islands for Brown Pelicans, which are currently heading north to feed and relax for a few months before heading back south for the winter [photo by Warren Cairo]. On a day when the rain is thundering down outside and it looks as though I might have to swim home down Sunset Boulevard later, it seems a good time to make a quick scan of the local media websites and see what is in the news out there. 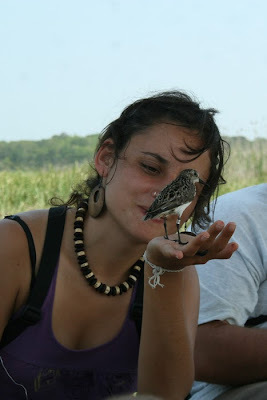 One story that will hopefully be of key interest to our readers is a great interview with New Jersey Audubon's Vice President of research, David Mizrahi and focuses on current work being carried on the worrying downward trend in Semipalmated Sandpiper numbers. One thing is for sure, and that is that diligent research is the only way to get the true picture and, to this end, David's team have been working both here on the Semipalmated Sandpiper's migration route and way down in South America on the wintering grounds. The article makes for some very interesting reading so make yourself a cup of tea (or something stronger!) and have a look at the full article here: Red Knot isn't only shorebird facing decline. Weighing in at roughly one ounce and fitting quite comfortably on the palm of a hand, it is truly awesome to ponder on the migrations of a Semipalmated Sandpiper that will summer in the Arctic and winter in South America. Long-term banding studies in Cape May are providing vital information on these birds to help us understand their lives better, and to use that information to better ensure their survival on this crowded planet [photo by Mike Crewe]. Summer is always a great time to be out and about in the countryside and July is a particularly good month to be chasing butterflies. This month sees the annual Cape May County butterfly census taking place, a long-term project that is providing some interesting insight into the ups and downs of these interesting insects. Surveying insects is almost always a long-term affair, since many species have peaks and troughs in their population levels that can swing wildly from one extreme to the other and back again quite rapidly, making data collected in a single year rather limited in what it can tell us. There are many reasons for these big population swings, the most apparent being the effects of weather (both during flight periods and during the winter months) and the effects of predators - and predators can include obvious things like birds, or far less obvious things like parasite loads. While it seems to have been an excellent year for dragonflies so far this year, 2013 has generally been less favorable for butterflies so the results of the survey next week will be of great interest. Despite a poor showing of some species, however, there is still plenty of great butterfly moments to be enjoyed around Cape May and July really is the month to be out there. Just this past week I have noticed a very obvious increase in the number of butterflies I am seeing; Common Buckeyes are arriving from the south, Eastern Tiger Swallowtails continue a recent run of good years and an abundance of skippers is just about to burst upon us. Butterflies have become such an important part of so many people's lives; their often vibrant colors, vivacious lifestyles and pure 'Joie de Vivre' are enough to inspire artists, poets and gardeners alike. This Orange Sulphur on a garden Zinnia says it all [photo by Will Kerling]. OK, so it's not true that butterflies are always the colorful ones and moths the dull ones - but even this Saltmarsh Skipper posing on a Spotted Knapweed flower offers an interesting combination of colors and markings. This species will be peaking over the next few weeks and can be very plentiful on flowers some distance from saltmarsh breeding areas [photo by Mike Crewe]. Sometimes dull can mean rare! The so-called Rare Skipper got its name as it managed to elude the studies of mankind for nigh on 100 years after its initial discovery in the south-eastern US. We now know it to be very localised but occasionally common in certain parts of Atlantic coastal saltmarshes and it can often be one of the highlights of a day's butterfly viewing in Cape May County. Note the subtle pale rings on the abdomen and the orange tips to the antennae [photo by Mike Crewe]. Mimicry in butterflies is not uncommon, particularly in the tropics and has been well-studied. Perhaps the most obvious local example is the Viceroy (above) which does a pretty good job mimicking the Monarch [photo by Mike Crewe]. With many species on the decline, it is always nice to witness a success story. Eastern Tailed Blue has benefited from being adaptable and has readily taken to using introduced members of the pea family as a larval foodplant. This female was photographed during an egg-laying session on Japanese Clover [photo by Mike Crewe]. American Ladies sport wonderful big eye spots on the undersides of their leaves, readily identifying them from the very similar Painted Lady [photo by Will Kerling]. With butterflies really coming to the fore now - both in variety and in number - our Butterfly Bonanza workshop is perfectly timed. Spend a day with the incomparable Will Kerling and learn about the lifestyles of our butterflies and how to identify them. There's still time to book a place - just call us on 609-861-0700 and join us next Thursday for a day in the field. Having had a very nice Wednesday morning walk at the state park this morning (check out our events calendar! ), I can officially say that fall migration is well and truly under way. Post-breeding gatherings of terns have started on the South Cape May beach and included 10 or so Royal Terns, while the beach also provided us with a flock of eight American Oystercatchers (with two others further down) and our first Western Willet of the fall - a nice and easy long-billed, long-legged individual. Small parties of Short-billed Dowitchers and Lesser Yellowlegs passed overhead and a Spotted Sandpiper was on the plover ponds. A nice highlight was the sight of two Brown Pelicans lumbering out of the bay - birds probably heading northward still on a post-breeding dispersal at this time of year. Other birds of note recently include at least two Roseate Terns on a couple of occasions at South Cape May Beach, but recent increased disturbance there seems to be keeping them away and most recently I heard that they had been spending time at Two-mile Beach, where Michael O'Brien reported them on July 9th. A report of two male Ruddy Ducks from the mouth of the Tuckahoe River continues a run of reports of this species in the area this year, while a scattering of non-breeding Black Scoters seem to have all met up to molt, with 25 reported from the coastguard unit on 9th. But the breeding season is far from over for many birds. Also on this morning's walk, we noticed that a pair of House Wrens has taken over one of the nest boxes that Tree Swallows have now finished with, while we also watched a pair of Cedar Waxwings bringing nest material in to a Pitch Pine right beside the trail. Yellow-breasted Chats are vocal again at the state park and may be on second broods now and Orchard Orioles are still busy with nests there. A female Pine Warbler seen this morning was probably from the pair that appears to have bred in the state park this year. Our 'default' small tern in Cape May County is Forster's Tern, so it is always nice to get full on views of a Common Tern like this one every once in a while. Though birds will soon be losing their full breeding colors, there is still a little time to get out and practice separating these two, rather similar species. 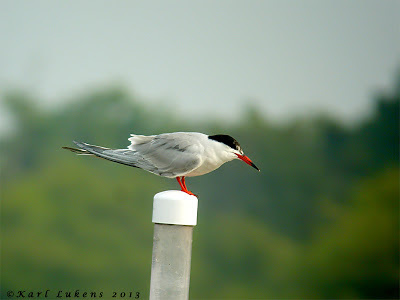 On this Common Tern, note the obviously scarlet - not orange - bill and legs [photo by Karl Lukens]. A little further afield, Brigantine continues to host a nice range of shorebirds, including a couple of Marbled Godwits and a Red-necked Phalarope recently. When it comes to the natural world, one thing you can always be sure of is that each year will have surprises in store. This is perhaps never more apparent than with our local insect populations, which can be heavily influenced by winter weather conditions. After a relatively mild winter and a cool, wet spring, butterfly numbers seem to be very low this year (and it will be interesting to see if our annual Cape May County butterfly counts confirm this). This slump in numbers may be due to the mild winter allowing high numbers of predators/parasites to survive and/or the damp spring, which can see large numbers of insect pupae be adversely affected by fungal infections. Conversely, dragonflies seem to be having a real boom year in Cape May County - perhaps as a group of insects that spend their immature stages in water, they benefited from a low number of days when waters froze over during the winter, and an abundance of surface water still around now for egg-laying opportunities. On one of our Birds, Beasts & Botany walks recently, we added Cox Hall Creek WMA to the sites at which we have found the diminutive Double-striped Bluet. This damselfly was first recorded in Cape May in 2010 and seems to be slowly increasing its range in the central part of the county [photo by Mike Crewe]. Over the past three years, we have been mapping the distribution of dragonfly species in Cape May County. Such projects can be repeated at intervals and this methodology can provide important insights into the state of the region's wildlife. 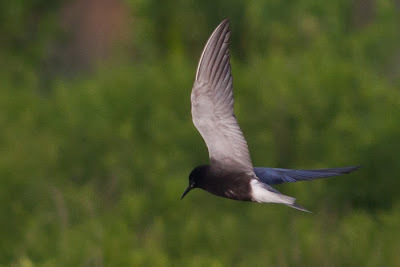 Finding a new species is always one of the potential highlights of such work, and a small colony of Blue-fronted Dancers (above) on a woodland trail near a pond in Lower Township provided the latest new discovery for the county [photo by Mike Crewe]. One of our more spectacular small damselflies is the Scarlet Bluet, a species of Special Concern in New Jersey. This year is proving to be a very good year for this species and it should be looked for in the north of Cape May County, on large ponds with plenty of emergent vegetation and water-lilies [photo by Mike Crewe]. Some species display greatly fluctuating population levels, perhaps none more so in Cape May than the Sweetflag Spreadwing. This species occurs at well-vegetated ponds in the lower half of the county and this year seems to be going through a real boom period. Spreadwings can be tough to identify to species, but modern digital cameras are making identifications in the field far easier for many species (including this one) and, thankfully, collecting insects is rapidly losing popularity, except where required for important scientific study at museums and other scientific faculties [photo by Mike Crewe]. Mocha Emerald is another species that Tony Leukering and I added to the Cape May County list in 2010. Another way that digital cameras can help is with simply allowing time to study an insect that won't stay still! I photographed this dragonfly as it hunted the treetops in Dennis Township recently and cropping and zooming in on the photo allows us to see the orange bands and narrowly-waisted abdomen of a male Mocha Emerald - our fourth location now for the species here. Without the camera, this individual would have remained unidentified [photo by Mike Crewe]. Again, the camera records the moment! Four-spotted Pennant is a southern species that, in Cape May County, seems to be confined to ponds south of the Cape May canal (though it has been recorded from Cumberland County in the past too). This individual was on a vernal pond in Rio Grande on Independence Day and may indicate that the species is beginning to establish itself northward. Continued monitoring will be the best way to be sure [photo by Mike Crewe]. The pennants are always a popular group of dragonflies, often preferring to perch openly atop a grass stem or dried stalk that offers a good vantage point to hunt insects - a handy finger tip was favored by this female Martha's Pennant! Six pennant species may be found in Cape May County and all seem to be doing very well this year. Banded, Martha's and Double-ringed Pennants are all rather local species here, but can currently be found on a number of ponds in the area [photo by Mike Crewe]. Recording our wildlife on a regular basis is not only important, it's also fun. But the first step is learning how to identify what we have. Saturday July 13th we will be holding our next dragonfly workshop, with much of the day spent enjoying these insects out in the field. We still have just a few spaces left so why not give us a call and book your place - with so many dragonflies around right now, this is the year to get started! I reckon Cape May has more than its fair share of rain so far this year, though we have had far less than the poor souls along the foot of the Appalachian ridge - and I am sure that those suffering yet another prolonged drought in the south-west would give anything for just a bucketful of our rain to water their gardens. Wave after wave of rain clouds and thunderheads have loomed on the horizon over the past month and dumped a record amount of water in the Philadelphia region - the most rain for June since records began I am told. Despite all this watery madness, wildlife has to get on with the daily grind, the daily chores of eating, and avoiding being eaten. No mean feat at times. So far, from what I have seen, this year's breeding season has been a real hardship for many birds. 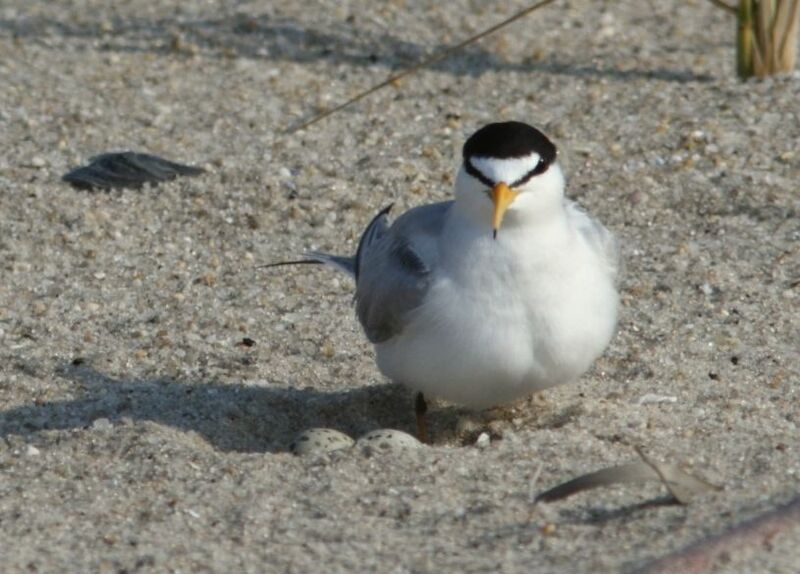 The entire Least Tern colony at South Cape May Beach was deserted a couple of weeks ago, and tracks in the sand seem to suggest that mammalian predators - probably Red Foxes and Raccoons - have been the main culprits. While ground nesters can soak up a certain amount of predation, a concerted effort by predators that know when they are on to a good thing can eventually cause the whole colony to break down. What to do? Well, tough decisions need to be made by those that are charged with looking after these birds; in our quest for pleasure and leisure, we have collectively sidelined so much of our wildlife - pushed it into a convenient corner where it can sit and not disturb us from our whims and fancies. Having reduced so many species to barely sustainable population levels in often less than optimum habitats, it falls upon brave guardians of our wildlife - those good people who work for such bodies as state Departments of Environmental Protection and Fish & Wildlife organizations - to come up with management plans to sustain these endangered species. Management plans often involve some very difficult decisions, and those decisions often mean having to control numbers of predatory species. All this is basic environmentalism, page 1 of the wildlife management text book, something that everyone who trained for the job has learned how to do, because it works; and yet these tough decisions often can't be made because of fears about public opinion. Over the past couple of months, the management of endangered species around Cape May has often cropped up in conversation on our regular weekly walks and one thing has become clear to me - public opinion does support doing the right thing. Controlling predators is not a fun day out at the park, it's a job that needs to be done and it seems to me that people understand this. Our coastal breeding birds are suffering heavily from predation by Fish Crows (a species at artificially high levels here due to the easy life we provide them through hand-outs and provision of more than enough breeding locations in our gardens), while areas provided for such species to take their chicks for post-hatching cover and feeding opportunities are being rendered totally unfit for purpose by an artifically over-abundance of introduced Mute Swans and Canada Geese. Wildlife no longer has the freedom to go where it wants and do what it wants; if we are going to shoe horn endangered species into convenient corners, then the very least we should do is look after them once they have been pushed there. OK, time for a lighter note - it is the glorious 4th of July after all - and last night's fireworks on the bayshore were a real treat (and topped just marginally for me only by my favorite Brit, Mark Cavendish, winning his first stage of this year's Tour de France in Marseille - go Manx Missile!!). While some species are no doubt suffering this year, others seem to be doing OK. I have certainly been noticing good numbers of Prothonotary Warblers in wet woods this year, as well as more than the usual number of Acadian Flycatchers calling from woodland around the county. Marsh Wrens and Clapper Rails have been remarkably easy to get to grips with at Jake's Landing for much of the spring and early summer period and I have recently been hearing of pairs of Gull-billed Terns regularly wandering the top end of Cape May County. There must surely be some species benefiting from the cicada crop this year too but a little more time is needed to see where that one goes. Though today was July 4th and a vacation for many, my wonderful, trusty volunteers and I were out leading a walk at Cox Hall Creek today. To celebrate the day, we took on the task of building up a list of species that represented the union; species that were listed as state birds, species with red, white or blue in their names, or species named after locations in the US. And of course, being our Birds, Bugs and Botany walk, we had a great wealth of species to choose from. In the event, we did pretty well - the likes of Carolina Chickadee and Maryland Meadow-beauty served up some state names, American Robin and American Crow of course gave us the whole country in one go and many red, white and blues filled our list - White Oak, Great Blue Skimmer, Red-bellied Woodpecker - the list was wholesome and good! Northern Cardinal and Northern Flicker made the grade as state birds. A good time was had by all and, if you couldn't make it, we look forward to seeing you next time! Happy Independence Day one and all!! 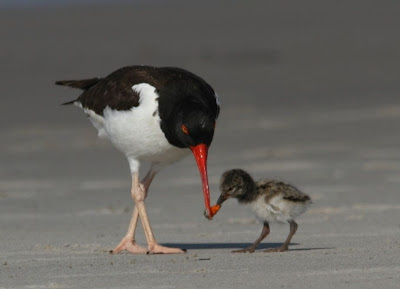 Some birds get on with the task of raising a family despite us Humans! This Killdeer has settled neatly into the gravel parking lot at The Nature Conservancy's South Cape May Meadows. This is a pretty late start, so this bird may well have already lost an earlier brood this year [photo by Mike Crewe]. A bird that certainly does well thanks to us Humans - but can you identify it? This fledgling Eastern Bluebird will wear this unfamiliar spotty plumage for just a few weeks before molting into its familiar blue and orange combination. This is a species that certainly benefits from the kindness of those who provide plenty of nest boxes for them to use [photo by Mike Crewe]. 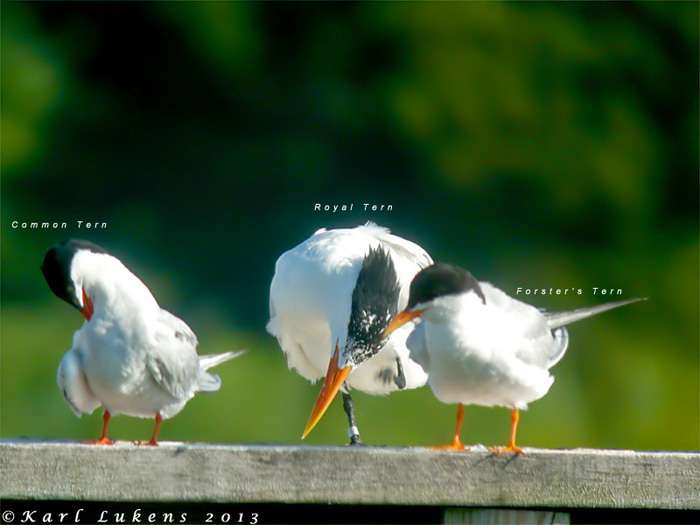 On our Wednesday walk at the state park this week we were treated to an impromptu tern workshop as our first Royal Terns of the season showed up. Royal Terns, with their black legs, slightly shaggy crests and large orange bills are pretty easy to identify, but this photo also helps demonstrate the subtle difference in leg color and leg length between Common and Forster's Terns [photo by Karl Lukens].